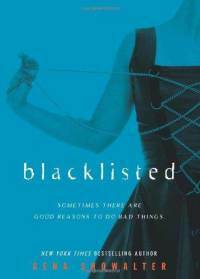 Blacklisted is the second YA novel set in the Alien Huntress world. Our hero is Erik, who was a secondary character in the previous book, Red Handed. When we saw him last, he was on the run, branded a drug dealer. His heroine is 18 year-old Camille, a regular girl with a crush on the wrong boy. She tries to get close to Erik, and gets thrown inside a world she didn’t know existed. Camille has an uber-crush on Erik, who she has seen in the halls of high school. She and a friend follow him to a club one night and she gets caught up in a bust designed to bring him down. She ends up on the run with Erik, learning he’s not a bad guy after all. In fact, he has sacrificed his good name to help aliens who need the drug he’s selling in order to survive. I liked seeing Phoenix and the other girls featured in Red Handed. Even Ryan and Mia showed up –-and I’m a sucker for reoccurring characters in a series. The love scene was sweet and slightly racier than I thought I would get in a YA… but VERY tame compared to most Showalter books. My only gripe with this book was that it flew by and seemed short. I can’t be sure without a word count… maybe it just went so fast because it was a good and an easy read. I liked it. I give it 4 stars, even though I would have loved to see Camille and Erik take that next step. I like this cover a lot. I’m wondering though, does it have a connection to the book? I really hate when a book speeds by, especially when I am enjoying it. Not really. I think it was probably chosen for the YA feel.